ZHAOQING, China – Having relied on HARMAN’s Soundcraft mixing consoles for more than a decade, Zhaoqing Radio in the Chinese province of Guangdong recently added two HARMAN Studer OnAir 2500 Modulo mixing consoles. The consoles were acquired from local HARMAN distributor ACE, and were installed in the two live studios that broadcast music and traffic information on the local radio. The ‘Modulo’ version of the Studer OnAir 2500 console can be integrated within custom studio furniture and is highly modular in its design. Its separate modules for fader bays and master section along with a rack-mountable mainframe can be recessed into a desktop for a clean installation with all cables integrated within the furniture and the mainframe hidden appropriately. Each console is equipped with 12 faders and a large number of inputs and outputs, providing the network with clean, intuitive mixing. 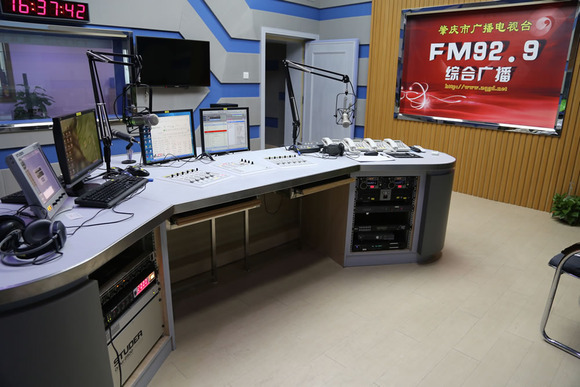 According to ACE Technician Liang Ke Zhang, the ultimate goal was to clean up distortions that hindered previous broadcasts and add clarity to the voices of radio hosts. While providing the renovated studios with a new streamlined look, the new OnAir Modulo consoles have proven to be a huge improvement when tested in recent daily broadcasting operations.